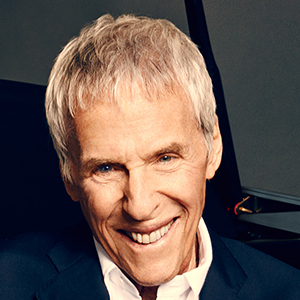 Burt Bacharach has been one of the most-honored and successful composers for six decades. A recipient of three Academy Awards and eight Grammys (including the 2008 Lifetime Achievement Award and 1997 Trustees Award with collaborator Hal David) he revolutionized the music of the 1950s and 60s. He was inducted into the Songwriters Hall of Fame, and is the recipient of other tributes received from top music industry institutions to governments, universities and charitable and philanthropic groups. From helping charitable organizations raise funds (“That’s What Friends Are For”), to Broadway (“Promises, Promises”), movies (“Raindrops Keep Fallin’ on My Head,” for Butch Cassidy and the Sundance Kid) to scores of new recordings of his songs each year, Bacharach’s music is always nearby. And, it’s as diverse as his audiences, spanning generations and continents, as he is celebrated both as a pop culture icon and one of the world’s greatest contemporary composers. Bacharach’s credits read like the world’s favorite radio stations’ playlist: “Alfie,” “Arthur’s Theme,” “Close To You,” “Do You Know The Way To San Jose,” “I Say A Little Prayer,” “I'll Never Fall In Love Again,” “This Guy’s In Love With You,” “Walk On By,” “What The World Needs Now Is Love,” and “Wishin' And Hopin’” are among just the 48 Top 10 hits, nine no. 1 songs. See the master perform at Southern California’s premier theater, The Show at Agua Caliente Casino Resort Spa.